The U.S. Army showed both animosity toward the Indians and disdain for the civilian Indian Agents. [unreliable source?] Soldiers and their commanding officers sometimes brutally tortured or killed the Indians for sport while politicians in Washington, D.C., knew little about differences in tribal cultures, customs, and language. 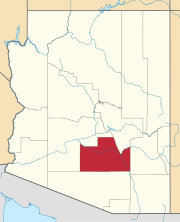 The 8th Cavalry was stationed in Arizona during this time until 1875. Politicians also ignored political differences and military alliances and tried to apply a "one-size-fits-all" strategy to deal with the "Indian problem". As a result, tribal friends and foes were forced to live in close proximity to one another. Meanwhile, the Apaches were supposed to be fed and housed by their caretakers, but they rarely saw the federal money and suffered as a result. Clum arrived at the reservation on August 4, 1874. 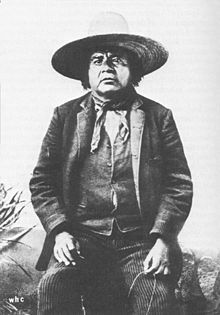 During his tenure at San Carlos, he struck a lifelong friendship with Eskiminzin, an Aravaipa Apache chief, and persuaded many of the White Mountain people to move south to San Carlos. Clum won the Indians' confidence and the Apaches responded by turning in their weapons. The Apaches formed a tribal court to try minor infractions and joined the Tribal Police organized under Clum's command, which helped to form a system of limited Indian self-rule. The agent soon attracted 4,200 Apache and Yavapai Indians to the semi-arid reservation. The Army bristled at Clum's actions because they prevented them from taking part of the funds that passed through the reservation. 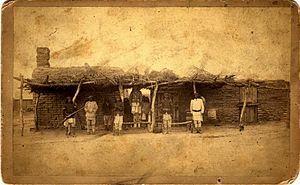 Guard House in San Carlos, Arizona circa 1880. Photograph by Camillus S. Fly. In March 1875, the government closed the Yavapai-Apache Camp Verde Reservation and marched the residents 180 miles (290 km) to the San Carlos Apache Indian Reservation. More than 100 Yavapai died during the winter trek. Today the Community Cibecue is part of the Fort Apache Reservation of the White Mountain Apache, historically with the communities Cedar Creek and Carrizo of the Cibecue Apache territory, various bands of Southern Tonto Apache, Tsiltaden ("mountain side people", a clan or band of the Chiricahua Apache a part of the Pinaleño), some Eastern White Mountain Apache (Dził Ghą́ʼ oder Dzil Ghaa a or 'On Top of Mountains People'), and the Lipan, Dzil Dlaazhe (Mount Turnbull Apache, a mixed Kwevekapaya San Carlos Apache band). By the early 1900s, Yavapais were drifting away from the San Carlos Reservation and were requesting permission to live at the original Camp Verde Reservation. After the Indian Reorganization Act of 1934, the various Apache groups formed a government and became federally recognized as the San Carlos Nation. Grenville Goodwin, an anthropologist who had lived with the Western Apache since the late 1920s, helped them to decide what government they wanted to form under the new law to gain more sovereignty. In 1999, the San Carlos Apache founded the Apache Nation Chamber of Commerce [ANCC] to "create environments that ensure the greatest opportunity to succeed, and to become self-sufficient for Indigenous and all communities." The ANCC encourages individuals and corporations to form business relationships with Arizona's tribal governments. The San Carlos Apache Tribe Wellness Center, established in 2003, is a tribally run out-patient mental health and substance abuse program. The new expanded clinic includes two round group rooms designed to simulate traditional Apache wickiups as well as sky lights to bring natural lighting into interior spaces and outside meeting space. The San Carlos Apache Tribe's Language Preservation Program, located in Peridot, Arizona, began its outreach in 2011 to the 14,000 tribal members to help preserve and develop the Apache language. In 2014, tribal Chairman Terry Rambler announced the establishment of the San Carlos Tribal College. The tribe signed a Memorandum of understanding with Arizona State University to help develop curriculum for its proposed two-year Associate degree. In December 2014, President Barack Obama signed the 2015 National Defense Authorization Act, which would give land sacred to the Apache in Arizona to Resolution Copper Mine [RCM], a joint venture owned by Rio Tinto and BHP Billiton. The Act cleared the way for the land swap in which Resolution Copper would receive 2,422 acres of National Forest land in exchange for deeding to the federal government 5,344 acres of private land. 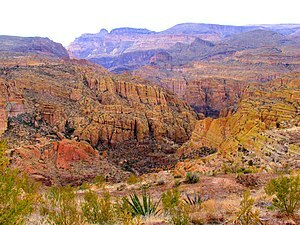 A proposal or rider in Section 3003 of the Act, titled "Southeast Arizona Land Exchange and Conservation Act", would allow RCM to develop and operate an underground copper mine 7,000-feet deep (approximately five Empire State buildings) in the publicly owned Tonto National Forest near Superior, Arizona. The mine would destroy an area set aside in 1955 by President Dwight D. Eisenhower that is sacred to the San Carlos Apache. The land contains more than 2,400 acres of the Oak Flat Campground, an area dotted with petroglyphs and historic and prehistoric sites. Said former San Carlos Apache tribal chairman Wendsler Nosie Sr. of the Act's attached rider: "This is Congressional politics at its worse, a hidden agenda that destroys human rights and religious rights." The San Carlos Apache Tribe, under the leadership of Chairman Terry Rambler, has led a strong opposition to the RCM land exchange. Both the National Audubon Society in Tucson and the Grand Canyon Chapter of the Sierra Club in Arizona along with the National Congress of American Indians have joined in the fight to Resolution's land grab. Native American groups and conservationists worry about the impact to surrounding areas, including the steep cliffs at Apache Leap. James Anaya, former United Nations special rapporteur on the rights of indigenous peoples, said that without community and tribal support, Rio Tinto should abandon its Resolution Copper mining project. United States Secretary of the Interior Sally Jewell said she was "profoundly disappointed with the Resolution Copper provision, which has no regard for lands considered sacred by nearby Indian tribes". By January 2015 over 104,000 had signed a petition to President Obama, "We the People|Stop Apache Land Grab". Jodi Gillette, Special Assistant to the President for Native American Affairs, quickly gave an official White House response, vowing that the Obama Administration will work with Resolution Copper's parent company Rio Tinto to determine how to work with the tribes to preserve their sacred areas. In March 2016, the Oak Flat campground was listed on the National Register of Historic Places. While the designated site, which is identified by the National Register as the "Chi'chil Bildagoteel Historic District" will not stop the Resolution Copper mine, a federal agency must evaluate the project's effects on the property before taking action. Bills introduced in 2015 by Sen. Bernie Sanders (D-Vermont) and Rep. Raúl Grijalva (D-Tucson) would reverse the land-exchange deal, but neither received a hearing. New legislation was introduced by Rep. Grijalva on Jan. 17, 2019  with the promise of a companion bill in the Senate to be sponsored by Bernie Sanders. The San Carlos Reservation's annual median household income of approximately $27,542, according to the US Census. About 49.2 percent of the people live under the poverty line, and 36.7 percent of the active labor force is unemployed. On 29 December 2018, a woman of the tribe gave birth to a son while in the Hacienda HealthCare facility in Phoenix, Arizona. The facility had been unaware that she was pregnant, until she was giving birth after which emergency ambulance assistance was called. The woman was 29 years old at the time, and had been institutionalised because of intellectually disability (persistent vegetative state) from of seizures in at age 3. In late January 2019, 36-year-old Nathan Sutherland, a licensed nurse, was arrested by Phoenix police on suspicion of one count of sexual assault and one count of vulnerable adult abuse, after being required by a court to give a DNA test along with other male staff at Hacienda. The facility also announced that one doctor had resigned, and another had been suspended. The tribe announced that it would care for the baby. The San Carlos Apache Indian Reservation encompasses 1.8 million acres of land area in northern Graham, southeastern Gila, and eastern Pinal Counties. 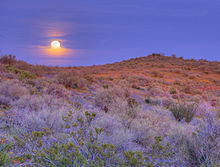 The reservation's communities include Bylas, Gilson Wash, Peridot, and 7mile. The San Carlos Lake was formed by the construction of Coolidge Dam and is the second largest body of water in Arizona. The reservation is the tenth-largest Indian reservation in land area with desert, alpine meadows, and Ponderosa Pine forest. The Fort Apache Indian Reservation, which has a smaller land area, is directly north. The San Carlos Apache Culture Center tells the stories and history of the Apache people. The Apache Gold Casino, owned and operated by the San Carlos Apache Nation, offers gaming, dining and lodging. The San Carlos Recreation and Wildlife Department offers hunting, fishing, boating, camping, birdwatching, and nature study on the scenic 2,900-square-mile (7,500 km2) reservation. Tribal permits (required) available from local convenience and sporting-goods stores. ^ Chiricahua-Apache.com (2009). "Native American Prisoners of War: Chiricahua Apaches, 1886-1914". Retrieved January 8, 2015. ^ Allen, Lee (October 26, 2011). "Nike N7 Grant Offers Healthy Hope for Diabetes Prevention Among San Carlos Apache Youth". Indian Country Today Media Network. Retrieved January 14, 2015. ^ Kappler, Charles J. (December 1, 1902). "Indian Affairs: Laws and Treaties". I, Laws: 813. ^ a b c Ladoux, Gary (2007). Nantan: The Life and Times of John P. Clum: Volume 1: Claverack to Tombstone 1851-1882. Trafford Publishing (paperback). ^ a b Glauthier, Martha (2007). "San Dimas Remembered – John P. Clum, Indian Agent". San Dimas Historical Society. Archived from the original on August 7, 2008. Retrieved February 2, 2008. ^ Braatz, Timmothy (2003). Surviving Conquest: A History of the Yavapai Peoples. University of Nebraska Press. p. 122. ISBN 0-8032-1331-X. ^ Rambler, Sandra (November 9, 2011). "Arizona Silver Belt Tribe Focuses on Preservation of Apache Language". Arizona Silver Belt. Archived from the original on May 25, 2014. Retrieved December 12, 2012. ^ Lee, Tanya H. (August 18, 2014). "New Tribal College Will Be Major Milestone for San Carlos Apache". Indian Country Today Media Network. Retrieved January 11, 2015. ^ Arizona Geology, “Resolution copper land swap bill signed into law,” 23 Dec. 2014. 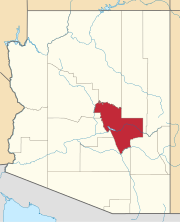 ^ a b "San Carlos Apache Tribe Announces Towns of Superior and Queen Valley Join Opposition to H.R. 687 Southeast Conservation and Land Exchange Act of 2013". NewsRx. April 7, 2013. ^ "Once Again, The Fight for Religious Freedom in America Begins". The Apache Messenger. December 22, 2014. Retrieved January 18, 2015. ^ Bregel, Emily (December 11, 2014). "Apache Tribe Distressed by Privatization of Sacred Land". Arizona Daily Star. Retrieved January 8, 2015. ^ Anaya, James (December 28, 2014). "Copper Mine Will Hurt Tribes and the Environment". The Arizona Republic. Retrieved January 11, 2015. ^ U.S. Department of the Interior (December 9, 2014). "Statement by Interior Secretary Sally Jewell on the National Defense Authorization Act for Fiscal Year 2015". Retrieved January 9, 2015. ^ "White House Responds to 'Stop Apache Land Grab' Petition". Indian Country Today Media Network. January 13, 2015. Retrieved January 14, 2015. ^ "Oak Flat Designation a Win for Mine Opponents, But Fight May Continue". Arizona Daily Sun. March 14, 2016. Retrieved April 5, 2016. ^ Rambler, Sandra (August 14, 2014). "Tribe Looking to Increase Enrollment". Eastern Arizona Courier. Retrieved January 8, 2015. ^ "Table B19103, Median Household Income in the past 12 months (in 2015 inflation-adjusted dollars)". American Fact Finder. U.S. Census Bureau, 2011-2015 American Community Survey 5-year Estimates. Retrieved 28 December 2016. ^ "Selected Economic Characteristics". American Fact Finder. U.S. Census Bureau, 2011-2015 American Community Survey 5-year Estimates. Retrieved 28 December 2016. ^ Inter Tribal Council of Arizona, Inc. (2011). "San Carlos Apache Tribe Introductory Information". Retrieved January 8, 2015. Wikimedia Commons has media related to San Carlos Apache Indian Reservation.